The event was organized by Fred Isaacs, Amy Thomson and Susan Isaacs. Tor Books and Baen Books, awarded jointly, for continuing to publish great science fiction of whatever kind. R.A. Heinlein, In Dialogue with his Century, Vol. 2, The Man Who Learned Better, 1948-1988, by William H. Patterson. Tepper reports that no one wrote down the names of the 2015 Hogu Award categories or the winners, so we will stop now…. 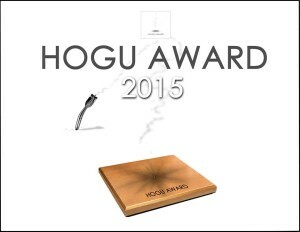 This entry was posted in Awards and tagged black hole, Hogu Awards by Mike Glyer. Bookmark the permalink. Aw crap, I looked at the 1982 ballot results. Do I owe you 50 cents? Now THIS is the slate proof system we need! Also, congrats on this great honour Mike! I’m honored, and extremely perplexed how I’m going to explain this to people. Thanks to all the voters! I mean, assuming there were voters and I wasn’t put on as part of a slate or something. I’d like to thank everyone who made this possible. *fumbles index cards onto the stage* Um … thank you and good night. Well. Unaccustomed as I am to public spe–stop that laughing! I’d like to thank David Mack, who decided it was easier to rewrite part of my story rather than explain where it needed polishing, thereby starting this collaboration. And I’d like to thank the Dinosaur who inspired the story, and the dinosaurs who made it necessary to write the story. In closing, I hope this is the start of a Brand New Day, because we’re all pretty tired of the old one. Aristotle Award has Noah Ward as a candidate. Mike, where are you hiding the time machine and can I borrow it for a few? Then the Grade School Yard bully politics of the puppies has been surpassed. I thought giving awards to Kary English’s Totaled, Mike Resnick, and Toni Weisskopf was a rather kind gesture, myself. Once again, Puppies assume that “It’s All About The Puppies”. The egos on those people are unbelievable. The Hogus and the Blackhole Ranquet is an old fannish tradition, and was not instituted as a response to the Puppies. I went to at least two Ranquets, years ago. Esther Friesner Queen of Hamsters was the Guest of Honor and Emcee at at least one. Categories included Most Desired Gafiation. I forget who various winners were… and I also remember the days of the Mid-Atlantic Fan Fund….. The Worldcon has Traditions, and the Ranquet was a tradition which, um, recognized, er, “Bad Behavior” and outstanding unprofessionalism, with its vote early, vote often, pay bribes, voting protocols. It was NOT meant to be impartial, not the in the least! Note that various recipients of IgNobel Awards, have often been gracious in their acceptances of what are essentialy Dubious Achievement Awards. Scientists tend to not generally be known as professionals with sense of humor, but those accepting IgNobels with graciousness, DO have sense of humor!